To open the PDF file just click on the picture of the City Tour Map! The starting point is for the Vienna City Center Tour is the easy reachable Opera in the heart of Vienna. The metro lines U1, U2 and U4 stop at the Karslplatz near the Opera building. The route leads mainly through nice parks, pedestrian areas and streets in low traffic areas. The paths are all asphalted. So you are able to reach all the most important sights in the old town of Vienna by using a route which avoids the traffic in the city as good as possible. 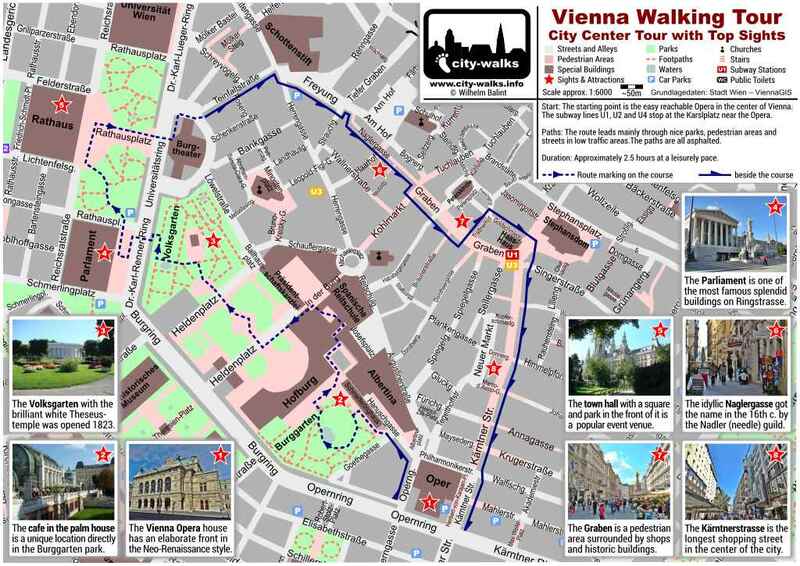 The Vienna City Center Tour takes approximately 2.5 hours at a leisurely pace. In this time estimation an extended sightseeing and a bit of window shopping on the way is also already considered.